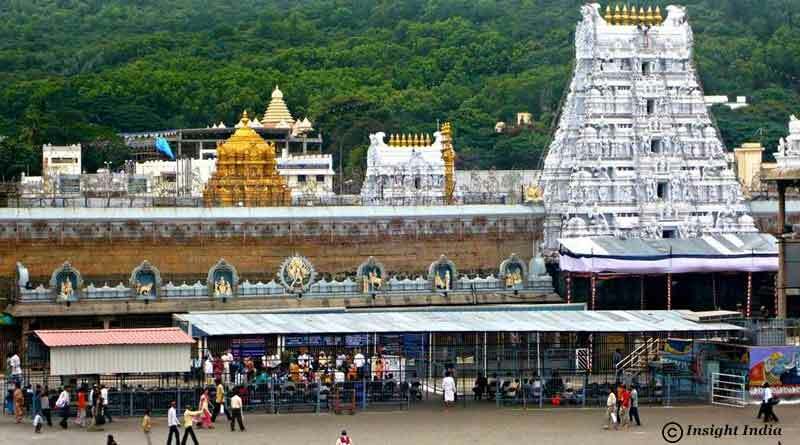 One of the most famous and sacred Hindu temple not only India but the world, Tirupati Balaji Temple is located in Chittoor district of Andhra Pradesh. The temple is widely renowned as the place chosen by Lord Vishnu as his alternative celestial home, Vaikuntha. The central temple of Tirumala lies Venkatadri, giving it the name of “The Temple of Seven Hills”. 1.The Tirumala Hill Ranges which lie 1 km north of the temple depict the face of Lord Balaji. They are a natural arch which represents Lord Balaji itself and is also known as Silathoranam in Telugu where ‘Sila’ means the rock and ‘Thoranam’ means an arch. This is a true miracle and one which just confirms that it was indeed Lord Balaji’s abode. 2.The town plays an important role in one of the most important texts in Hinduism, the Ramayana. During Treta Yugam, Lord Sri Rama is said to have resided here along with Sita Devi and Lakshmana on his return from Lankapuri. 3.The stick which was used by Ananthaalvar to hit Venkateshwara Swamy is present at the main entrance of the temple. The stick was responsible for starting the practice and tradition of applying sandalwood paste on injuries after it was applied on Swamy’s bleeding chin after being struck by the stick. 4.Folklore has that the main idol of Lord Venkateshwara Swamy has real hair on it. It is said that the hair is always silky smooth and never tangles. 5.Despite applying Green Camphor on the idol of Balaji every day there is no damage to the stone. This is a scientific miracle as the chemical usually results in cracks when applied to granite and stone. 6.The back of Swamy’s idol always remains wet despite being wiped as many times. One can even listen to the sound of water flowing in an ocean from the back of the idol. 7.The oil lamps used for worshipping Lord Balaji never extinguish despite being lit thousands of years ago. It is said that no wind, rain or storm has even been able to diminish them. How was Ravana’s funeral rites performed and who performed it? How did the idol of Balaji located in its present location.? Has it been moved by the Vijaynagar Kingsto protect against Islamic invasion.